Joe McDonnell Lyrics Guitar Chords and Music Notes. The Wolfe Tones, Written By Brian Warfield, I think this is one of Brian's best pieces of work ever.It's also Tommy Byrne's favorite song to sing on stage.-A Classic. On Tuesday 5 May 1981 Bobby Sands died on the hunger strike after 66 days, Joe McDonnell took his place on Friday 8th May 1981 afer 61 days, Joe McDonnell died. The mandolin, banjo tab is below in abc format. Recently recorded by Eire Og, The Davitts and Athenrye. Brian wrote this song on the morning Joe McDonnell died. striker had died and I was shocked, saddened and angry. for much, there should have been a solution. Thatcher and her government refused to give an inch. spoke through me on that morning, the story just flowed. year. 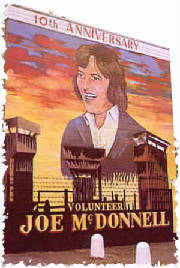 Joe McDonnell aged 30 was the fifth man to die. who deserve their place in the history of our country.